Former Liverpool and Manchester City star Steve McManaman has discussed this season’s Premier League title race and highlighted one surprise name who could be key for the reigning champions. BT Sport pundit McManaman pointed to the fine form of City left-back Benjamin Mendy since his return from injury, describing him as an ‘incredible’ player who is like a new signing for Pep Guardiola’s side. 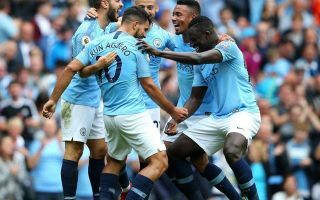 City strolled to the title last season but have generally been expected to face more competition from Liverpool in particular this term, though McManaman believes the rest of the league are still playing catch-up. When asked about how his old club Liverpool might do, the former Reds attacker suggested he still feels it’s his other former club that will remain the force in England for the time being. ‘It’s going to be difficult because City were streets ahead of everyone else last year,’ McManaman told CaughtOffside. ‘They’ve brought (Riyad) Mahrez in to boost their squad. And Benjamin Mendy, who’s an incredible left-back, hopefully he stays fit after a bit of misfortune last season, because he’s a brilliant left-back … it’s like two new players.